Unfortunately, your registration has been declined by the auctioneer. You can contact the auctioneer on +44 (0)20 7871 2640 for more information. You are the current highest bidder! To be sure to win, log in for the live auction broadcast on 31 May 2018 13:00 BST or increase your max bid. Heraldry.- Heard (Sir Isaac, herald, Garter Principal King of Arms, 1730-1822) & Thomas Lock, Clarenceux King of Arms, fl. 1784-1803) Grant of arms to Benjamin Vaughan, Captain in the Royal Artillery and licence to use the surname Marlow, Ds., manuscript on vellum, large watercolour coat of arms in left hand corner, 2 wax seals in black and gilt floral decorated metal skippets, slightly yellowed, preserved in a contemporary gilt stamped calf box lined with Dutch floral paper, rubbed, brass catches, 335 x 440mm., 1784. ⁂ Benjamin Marlow (1715-95), naval officer; present at the Battle of Minorca commanded by the ill-fated Admiral Byng. Served variously in actions in North America and India. All purchased lots are available to collect from our premises at 220 Queenstown Road, London SW8 4LP, Monday-Friday between 9:30am and 5:30pm. Please bring identification to collect your items. If you are arranging to have your lots collected by a third party, please email us in advance so we have the details of the individual or carrier. Please ensure that third parties also bring identification when collecting items. We have included below a list of suggested carriers who can pack and ship your items. If you would like us to obtain a packing and shipping quote on your behalf, please do not hesitate to contact us. We obtain and provide quotes as soon as possible but there sometimes may be a delay of up to 5 working days. Please note that we will release lots to you only upon receipt of your payment in cleared funds and that it can take up to one week for us to receive confirmation from our bank for the clearance of cheque payments. Late payment and storage charges may apply if items are not paid for and cleared within 10 working days of the auction. A 5% web premium charge will also apply to lots bought over a third party platform. 1. Introduction. The following notices are intended to assist buyers, particularly those that are new to our saleroom and internet bidding platforms. Our auctions are governed by our Terms and Conditions of Business incorporating the Terms of Consignment, the Terms of Sale supplemented by any notices that are displayed in our saleroom, the online catalogue listing or announced by the auctioneer at the auction. Our Terms and Conditions of Business are available for inspection at our saleroom and online at www.forumauctions.co.uk. Our staﬀ will be happy to help you with any questions you may have regarding our Terms and Conditions of Business. Please make sure that you read our Terms of Sale set out in this catalogue and on our website carefully before bidding in the auction. In registering to bid with us you are committing to be bound by our Terms of Sale. 2. Agency. As auctioneers we usually act on behalf of the seller whose identity, for reasons of conﬁdentiality, is not normally disclosed. If you buy at auction your contract for the goods is with the seller, not with us as auctioneer. 3. Estimates. Estimates are intended to indicate the hammer price that a particular lot may achieve. The lower estimate may represent the reserve price (the minimum price for which a lot may be sold) and cannot be below the reserve price. Estimates do not include the buyer’s premium, VAT or other taxes and fees (where chargeable). Estimates may be altered by a saleroom notice. 4. Buyer's Premium. The Terms of Sale oblige you to pay a buyer's premium on the hammer price of each lot purchased. Our normal rate of buyer’s premium is 25% of the ﬁrst £100,000 of hammer, reducing to 20% of the hammer price from £100,001 to £1,000,000 and then 12% of hammer price in excess of £1,000,000. 5. VAT. An amount equivalent to VAT is added to the buyer’s premium under the Auctioneer’s Margin Scheme and cannot be reclaimed as input VAT, even on export outside Eu. Additional VAT charges may apply and are marked, by lot, in our catalogue as described more fully in point 14. Please note that VAT is not payable on the buyers’ premium for certain goods, such as qualifying books. 6. Inspection of goods by the buyer. You will have ample opportunity to inspect the goods and must do so for any lots that you might wish to bid for. Please note carefully the exclusion of liability for the condition of lots set out in Clause 11 of our Terms of Sale. b. they require an Export Licence on the grounds of exceeding a speciﬁc age and/or monetary value threshold as set by the Export Licensing unit. We are happy to make the submission of necessary applications on behalf of our buyers but we will charge for this service only to cover the costs of our time. 8. Bidding. Bidding. Bidders will be required to register with us before bidding. Purchases will be invoiced to the buyer’s registered name and address only. When ﬁrst registering for an account with us you will need to provide us with proof of your identity in a form acceptable to us. IN REGISTERING FOR ANY SALE YOU AGREE TO BE BOUND BY OUR TERMS AND CONDITIONS REGARDLESS OF YOUR METHOD OF BIDDING. 9. Commission bidding. You may leave commission bids with us indicating the maximum amount (excluding the buyer’s premium and/or any applicable VAT, fees or other taxes) you authorise us to bid on your behalf for a lot. We will execute commission bids at the lowest price possible having regard only to the vendor reserve and competing bids. We recommend that you submit commission bids using your account on our website. 10. Live online bidding. When using our BidFORuM platform to participate in the auction through your account on our website there will be no additional charges. If you are using a third party live bidding platform then additional fees may be applicable. We will invoice these to you as an additional service and any applicable VAT will be separated out. 12. Collection and storage. Please note what the Terms of Sale say about collection and storage. It is important that you pay for and collect your goods promptly. Any delay may result in you having to pay storage charges of at least £1.50 per Lot per day as set out in Clause 7 of our Terms of Sale and interest charges of 1.5% per month on the Total Amount Due as set out in Clause 8 of our Terms of Sale. 13. Loss and Damage to Goods. We are not authorised by the FCA to provide insurance services. Liability for a lot passes to the buyer on the fall of the hammer or conclusion of an online auction (as applicable). In the event that you wish for us to continue to accept liability for your purchased lots this must be agreed with us in writing in advance of the sale and any agreed charges are payable before collection of the goods. b. [ARR] denotes a lot where Artist’s Resale Right or Droite de Suite royalty charges may be applicable to the Lot. Presently these charges are levied on a sliding scale at 4% of the hammer price up to Euro 50,000; 2% from Euro 50,001 to 200,000; 1% from Euro 200,001 to 350,000; 0.5% from Euro 350,001 to 500,000; and 0.25% above Euro 500,000 subject always to a maximum royalty charge of Euro 12,500. We will collect and pay royalty charges on your behalf and calculate the £ sterling equivalent of the Euro amount. c. [IMPORT] denotes that Import VAT at 5% is payable on the hammer price of the Lot. d. [VAT] denotes that VAT at 20% is payable on the hammer price, which may be reclaimable as input VAT. 15. Shipping. We can help you arrange packing and shipping of your purchases by arrangement with our shipping department. Please contact shipping@forumauctions.co.uk for a list of shippers we regularly use together with indicative pricing for packing and shipping. 16. Place of Publication. unless otherwise stated, all books described in our catalogues are published in London. You must read these Terms of Sale carefully. Please note that if you register to bid and/or bid at auction this signifies that you agree to and will comply with these Terms of Sale. If registering to buy over a Live Online Bidding Platform, including our own BidFORUM platform, you will be asked prior to every auction to confirm your agreement to these terms before you are able to place a bid. “Website” means our website available at www.forumauctions.co.uk. In these Terms of Sale, the words ‘you’, ‘yours’, etc. refer to you as the Buyer. The words “we”, “us”, etc. refer to the Auctioneer. Any reference to a ‘Clause’ is to a clause of these Terms of Sale unless stated otherwise. 1.1 A description of the main characteristics of each Lot as contained in the auction catalogue. 1.2 Our name, address and contact details as set out herein, in our auction catalogues and/or on our Website. 1.3 The price of the Goods and arrangements for payment as described in Clauses 6 and 8. 1.4 The arrangements for collection of the Goods as set out in Clauses 7 and 8. 1.5 Your right to return a Lot and receive a refund if the Lot is a Deliberate Forgery as set out in Clause 12. 1.6 We and Trader Sellers have a legal duty to supply any Lots to you in accordance with these Terms of Sale. 1.7 If you have any complaints, please send them to us directly at the address set out on our Website. 2.1 You must register your details with us before bidding and provide us with any requested proof of identity and billing information, in a form acceptable to us. 2.2 We strongly recommend that you either attend the auction in person or inspect the Lots prior to bidding at the auction. You are responsible for your decision to bid for a particular Lot. If you bid on a Lot, including by telephone and online bidding, or by placing a commission bid, we assume that you have carefully inspected the Lot and satisfied yourself regarding its condition. 2.3 If you instruct us in writing, we may execute commission bids on your behalf. Neither we nor our employees or agents will be responsible for any failure to execute your commission bid. Where two or more commission bids at the same level are recorded we have the right, at our sole discretion, to prefer one over others. 2.4 The Bidder placing the highest bid accepted by the Auctioneer for a Lot will be the Buyer at the Hammer Price. Any dispute about a bid will be settled at our sole discretion. We may reoffer the Lot during the auction or may settle any dispute in another way. We will act reasonably when deciding how to settle the dispute. 2.5 Bidders will be deemed to act as principals, even if the Bidder is acting as an agent for a third party. 2.6 We may bid on Lots on behalf of the Seller up to one bidding increment (as set at our sole discretion) below the Reserve. 2.7 We may at our sole discretion refuse to accept any bid. 2.8 Bidding increments will be set at our sole discretion. 2.9 Our Terms of Sale shall remain in force for any purchases made within 48 hours following an auction. 4.1 You shall be liable for the payment of any VAT and other duties applicable on the Hammer Price and premium due for a Lot. Please see the symbols used in the auction catalogue for that Lot and the “Information for Buyers” in our auction catalogue for further information. 4.2 We will charge VAT and other duties at the current rate at the date of the auction. 5.1 The contract for the purchase of the Lot between you and the Seller will be formed when the hammer falls accepting the highest bid for the Lot at the auction. 5.2 You may directly enforce any terms in the Terms of Consignment against a Seller to the extent that you suffer damages and/or loss as a result of the Seller’s breach of the Terms of Consignment. 5.3 If you breach these Terms of Sale, you may be responsible for damages and/or losses suffered by a Seller or us. If we are contacted by a Seller who wishes to bring a claim against you, we may at our discretion provide the Seller with information or assistance in relation to that claim. 5.4 We normally act as an agent only and will not have any responsibility for default by you or the Seller (unless we are the Seller of the Lot). 6.1.2 pay to us within 3 working days the Total Amount Due in any way that we agree to accept payment or in cash (for which there is an aggregate upper limit of 15,000 euros for all purchases made in any auction). 6.2 If you owe us any money, we may use any payment made by you to repay prior debts before applying such monies towards your purchase of the Lot(s). 7.1 Once you have paid us in full the Total Amount Due for any Lot, ownership of that Lot will transfer to you. You may not claim or collect a Lot until you have paid for it. 7.3 If you do not collect the Lot within this time period, you will be responsible for removal, storage and insurance charges in relation to that Lot which will be no less than £1.50 per Lot per day. 7.4 Risk of loss or damage to the Lot will pass to you at the fall of the Hammer or when you have otherwise purchased the Lot. 7.5 If you do not collect the Lot that you have paid for within forty-five days after the auction, we may sell the Lot. We will pay the proceeds of any such sale to you, but will deduct any storage charges or other sums that we have incurred in the storage and sale of the Lot. We reserve the right to charge you a selling commission at our standard rates on any such resale of the Lot. 8.1.8 if we sell any Lots for you, use the money made on these Lots to repay any amount you owe us. 8.2 We will act reasonably when exercising our rights under Clause 8.1. We will contact you before exercising these rights and try to work with you to correct any non- compliance by you with these Terms of Sale. 10.1.3 as far as the Seller is aware, the main characteristics of the Lot set out in the auction catalogue (as amended by any notice displayed in the saleroom or announced by the Auctioneer at the auction) are correct. For the avoidance of doubt, you are solely responsible for satisfying yourself as to the condition of the Lot in all respects. 10.2 If, after you have placed a successful bid and paid for a Lot, any of the warranties above are found not to be true, please notify us in writing. Neither we nor the Seller will be liable, under any circumstances, to pay you any sums over and above the Total Amount Due and we will not be responsible for any inaccuracies in the information provided by the Seller except as set out below. 10.3 Please note that many of the Lots that you may bid on at our auction are second- hand. 10.4 If in an Exclusively Online Auction a Lot is not second-hand and you purchase the Lot as a Consumer from a Seller that is a Trader, a number of additional terms may be implied by law in addition to the Seller’s warranties set out at Clause 10.1 (in particular under the Consumer Rights Act 2015). These Terms of Sale do not seek to exclude your rights under law as they relate to the sale of these Lots. 10.5 Save as expressly set out above, all other warranties, conditions or other terms which might have effect between the Seller and you, or us and you, or be implied or incorporated by statue, common law or otherwise are excluded. 11.1 Our descriptions of the Lot will be based on: (a) information provided to us by the Seller of the Lot (for which we are not liable); and (b) our opinion (although we do not warrant that we have carried out a detailed inspection of each Lot). 11.2 We will give you a number of opportunities to view and inspect the Lots before the auction. You (and any consultants acting on your behalf) must satisfy yourself about the accuracy of any description of a Lot. We shall not be responsible for any failure by you or your consultants to properly inspect a Lot. 11.3 Representations or statements by us as to authorship, genuineness, origin, date, age, provenance, condition or estimated selling price involve matters of opinion. We undertake that any such opinion will be honestly and reasonably held, subject always to the limitations in 10.1, and accept liability for opinions given negligently or fraudulently. 11.4 Please note that Lots (in particular second-hand Lots) are unlikely to be in perfect condition. 11.4.1 Lots are sold “as is” (i.e. as you see them at the time of the auction). Neither we nor the Seller accept any liability for the condition of second-hand Lots or for any condition issues affecting a Lot if such issues are included in the description of a Lot in the auction catalogue (or in any saleroom notice) and/ or which the inspection of a Lot by the Buyer ought to have revealed. 12.1 You may return any Lot which is found to be a Deliberate Forgery to us within twelve months of the auction provided that you return the Lot to us in the same condition as when it was released to you, accompanied by a written statement identifying the Lot from the relevant catalogue description and a written statement of defects prepared by an accredited expert. 12.2.2 you personally are not able to transfer good and marketable title in the Lot to us, you will have no right to a refund under this Clause 12.2. 12.3 If you have sold the Lot to another person, we will only be liable to refund the Total Amount Due for the Lot. We will not be responsible for repaying any additional money you may have made from selling the Lot or any other costs you have incurred in relation to the Lot save for those Lots purchased in exclusively online auctions from a Trader. 12.4 Your right to return a Lot that is a Deliberate Forgery does not affect your legal rights and is in addition to any other right or remedy provided by law or by these Terms of Sale. 13.1 We will not be liable for any loss of opportunity or disappointment suffered as a result of participating in our auction. 13.2 In addition to the above, neither we nor the Seller shall be responsible to you and you shall not be responsible to the Seller or us for any other loss or damage that any of us suffer that is not a foreseeable result of any of us not complying with the Conditions of Business. Loss or damage is foreseeable if it is obvious that it will happen or if at the time of the sale of the Lot, all of we, you and the Seller knew it might happen. 13.3 Subject to Clause 13.4, if we are found to be liable to you for any reason (including, amongst others, if we are found to be negligent, in breach of contract or to have made a misrepresentation), our liability will be limited to the Total Amount Due as paid by you to us for any Lot. 13.4.3 any liability which cannot be excluded by law. 14.1 All notices between you and us regarding these Terms of Sale must be in writing and signed by or on behalf of the party giving it. 14.2.3 by email, provided that a copy is also sent by pre-paid post or Recorded Delivery. b. to you, by sending the notice to any email address that you have given to us as your contact email address. 14.4.3 if sent by email, at the time of transmission unless sent after 17.00 in the place of receipt in which case they will be deemed to have been received on the next business day in the place of receipt (provided that a copy has also been sent by pre-paid post or Recorded Delivery). 14.5 Any notice or communication given under these Terms of Sale will not be validly given if sent by fax, email (unless also delivered Recorded Delivery), any form of messaging via social media or text message. We will hold and process any personal data in relation to you in accordance with the principles underlying the Data Protection Act. Our registration number with the Information Commissioner is ZA178875. 16.1 If you are contracting as a Consumer and the Seller of a Lot is a Trader, you will have a statutory right to cancel your purchase of that Lot if you change your mind for any reason. The provisions below set out your legal right to cancel. Further advice about your legal right to cancel your purchase is available from your local Citizens Advice Bureau or Trading Standards office. 16.2 You may cancel your purchase at any time from the date of the Order Confirmation up to the end of the fourteenth day after the day of collection of the Lot by you or the person specified by you for collection (e.g. if you receive an Order Confirmation on 1 January and you collect a Lot on 10 January, you may cancel at any time between 1 January and the end of the day on 24 January). 16.3 To cancel your purchase, you must inform us of your intention to cancel it. The easiest way to do so is to complete the model cancellation form attached to your Order Confirmation. If you use this method, we will email you to confirm that we have received your cancellation. Alternatively, you can email us at office@forumauctions.co.uk. If you send us your cancellation notice by email or by post, then your cancellation is effective from the date you send us the email or post the letter to us. 16.4 If you exercise your right to cancel your purchase, you will receive a refund of the Total Amount Due paid for the Lot in accordance with Clause 17. When exercising the cancellation right, you must return the Lots to us immediately at your own cost (as set out below). 16.5 Following purchasing of Lots, you are entitled to a reasonable opportunity to inspect the Lots (which will include removing them from their packaging and inspecting them). At all times, you must take reasonable care of the Lots and must not let them out of your possession. If you are in breach of your obligations to take reasonable care of the Lots in this Clause 16.5, we will have a claim against you and may deduct from the refund costs incurred by us as a result of the breach. 16.6 Details of this statutory right, and an explanation of how to exercise it, are also provided in the Order Confirmation. This provision does not affect your statutory rights. 16.7 The cancellation right described in this Clause is in addition to any other right that you might have to reject a Lot, for instance because it is a Deliberate Forgery as set out in Clause 12. 17.1 Where you have validly returned a Lot to us under your right of cancellation described in Clause 16, we will refund the full amount paid by you for the Lot. 17.2 Please note that we are permitted by law to reduce your refund to reflect any reduction in the value of the Lot, if this has been caused by your handling of the Lot in a way contrary to the conditions specified in these terms or which would not be permitted during a pre-sale exhibition held prior to an auction. If we refund you the price paid before we are able to inspect the Lot and later discover you have handled the Lot in an unacceptable way, you must pay us an appropriate amount. 17.3 You will be responsible for returning the Lot to us at your own cost. 17.4.2 if you have not collected the Lot or you have already returned the Lot to us: fourteen days after you inform us of your decision to cancel the Contract. 17.5 We will refund you using the same means of payment that you used for the transaction. 17.6 Legal ownership of a Lot will immediately revert to the Seller if we refund any such payment to you. 17.7 For further information on how to return Lots to us, please get in touch with us using the contact details provided on our Website. 18.1 We may at our sole discretion, though acting reasonably, refuse admission to our premises or attendance at our auctions by any person. 18.2 We act as an agent for our Sellers. The rights we have to claim against you for breach of these Terms of Sale may be used by either us, our employees or agents, or the Seller, its employees or agents, as appropriate. Other than as set out in this Clause, these Terms of Sale are between you and us and no other person will have any rights to enforce any of these Terms of Sale. 18.3 We may use special terms in the catalogue descriptions of particular Lots. You must read these terms carefully along with any glossary provided in our auction catalogues. 18.4 Each of the clauses of these Terms of Sale operates separately. If any court or relevant authority decides that any of them are unlawful, the remaining clauses will remain in full force and effect. 18.5 We may change these Terms of Sale from time to time, without notice to you. Please read these Terms of Sale for every sale in which you intend to bid carefully, as they may be different from the last time you read them. 18.6 Except as otherwise stated in these Terms of Sale, each of our rights and remedies are: (a) are in addition to and not exclusive of any other rights or remedies under these Terms of Sale or general law; and (b) may be waived only in writing and specifically. Delay in exercising or non-exercise of any right under these Terms of Sale is not a waiver of that or any other right. Partial exercise of any right under these Terms of Sale will not preclude any further or other exercise of that right or any other right under these Terms of Sale. Waiver of a breach of any term of these Terms of Sale will not operate as a waiver of breach of any other term or any subsequent breach of that term. 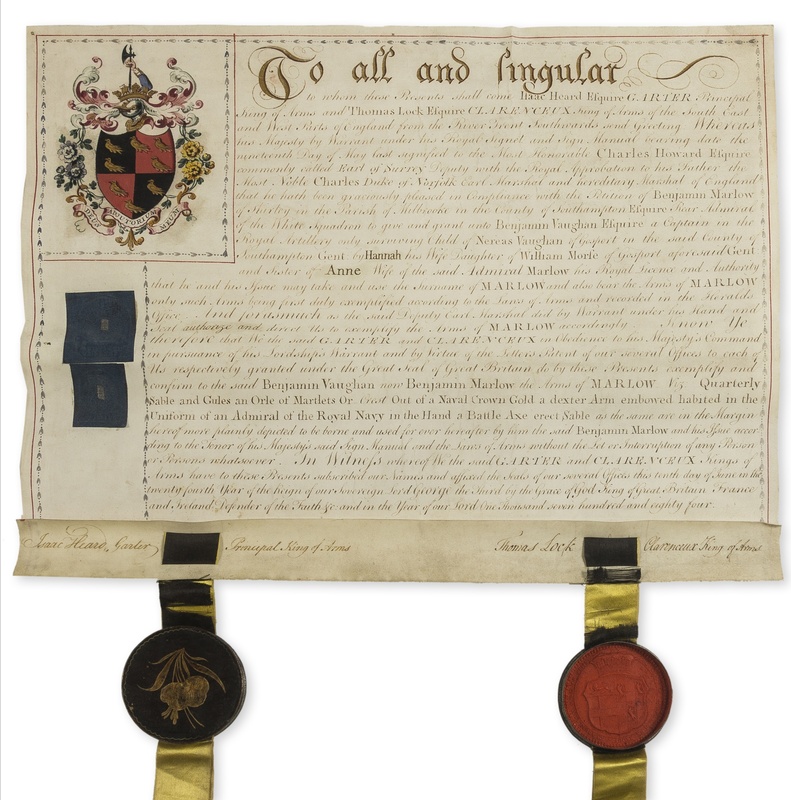 18.7 These Terms of Sale and any dispute or claim arising out of or in connection with them (including any non-contractual claims or disputes) shall be governed by and construed in accordance with the laws of England and Wales and the parties irrevocably submit to the exclusive jurisdiction of the English courts.